Where there are people, there are disagreements and misunderstandings. The author of 30 Days to Taming Your Tongue (more than 500,000 copies sold), a popular speaker, and a relationship strategist, Deborah Smith Pegues draws on biblical principles, personal experience, and research to show how to approach difficult situations so relationships are strengthened rather than broken. Meeting face-to-face to resolve an issue is difficult, but Pegues makes it easier by revealing how to avoid complications, sharing examples of good communication, and offering specific steps for dealing with conflicts. ... 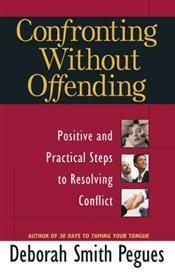 Confronting Without Offending gives readers the tools to successfully talk over and resolve issues and misunderstandings at home, at work, and in social situations.